Amy Winehouse was a famous Musician from England, who lived between September 13, 1984 and July 23, 2011. She became only 26 years old. The 18 May 2007, Winehouse married with Blake Fielder-Civil in Florida. In August of that year they lay down both into a rehabclinic, but canceled the stay after a few days. It was in 2007 announced that Winehouse struggled with both substance abuse, eating disorders and depression. In the autumn of 2007, her husband was arrested and jailed after a raid at their home in London. 16. July 2009, the divorce with Blake Fielder-Civil a fact after a turbulent marriage consisting of adultery and arguing. 23. July 2011 in the afternoon was Amy Winehouse found dead at his home in Camden, London. The cause of death was notdetermined, but the press was supposed to be the consequence of an overdose. The 23 august was available, however, results of the toxicological examination of the autopsy. The report said that it was not proven illegal substances in the samples, and only moderate amounts of alcohol, that they should not have been able to determine the cause of death. 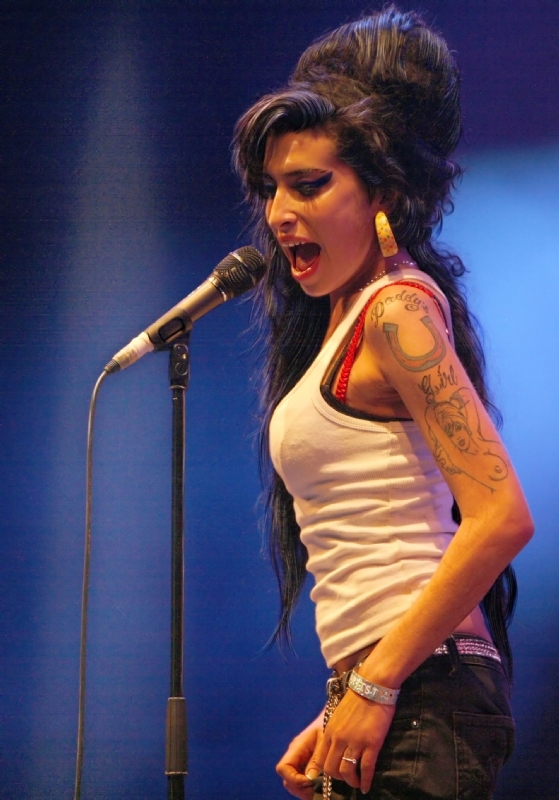 In late October, the cause of death finally determined; Amy Winehouse had not only moderate amounts of alcohol in the body, with a blood alcohol of 4.16 was the cause of death of alcohol poisoning. It is claimed in retrospect that Winehouse died 22 July, at night and not 23, as it was claimed first. She is born under the zodiac virgo, who is known for Analyzing, Practical, Reflective, Observation, Thoughtful. Our collection contains 13 quotes who is written / told by Amy. "Since I was 16, I've felt a black cloud hangs over me. Since then, I have taken pills for depression"
"My justification is that most people my age spend a lot of time thinking about what they're going to do for the next five or ten years. The time they spend thinking about their life, I just spend drinking"
"I'm of the school of thought where, if you can't sort something out for yourself, no one can help you. Rehab is great for some people but not others"
"I saw a picture of myself when I came out of the hospital. I didn't recognize myself"
"I really thought I was on the way out. My husband Blake saved my life. Often I don't know what I do, then the next day the memory returns. And then I am engulfed in shame"
"I really started writing music to challenge myself, to see what I could write"
"I like pin-up girls. I'm more of a boy than a girl. I'm not a lesbian, though - not before a sambuca anyway"
"I know I'm talented, but I wasn't put here to sing. I was put here to be a wife and a mom and look after my family. I love what I do, but it's not where it begins and ends"
"I just dress like... I'm an old black man. Sorry! Like I'm an old Jewish black man. I just dress like it's still the '50s"
"I don't think your ability to fight has anything to do with how big you are. It's to do with how much anger is in you"
"Having listened to great songwriters like James Taylor and Carole King, I felt there was nothing new that was coming out that really represented me and the way I felt. So I started writing my own stuff"
"Girls talk to each other like men talk to each other. But girls have an eye for detail"